DEM L238 and DEM L249 are two supernova remnants in the Large Magellanic Cloud. X-ray data from NASA's Chandra and ESA's XMM-Newton observatories suggest that the stars responsible for these debris fields were unusually young when they were destroyed by thermonuclear explosions. 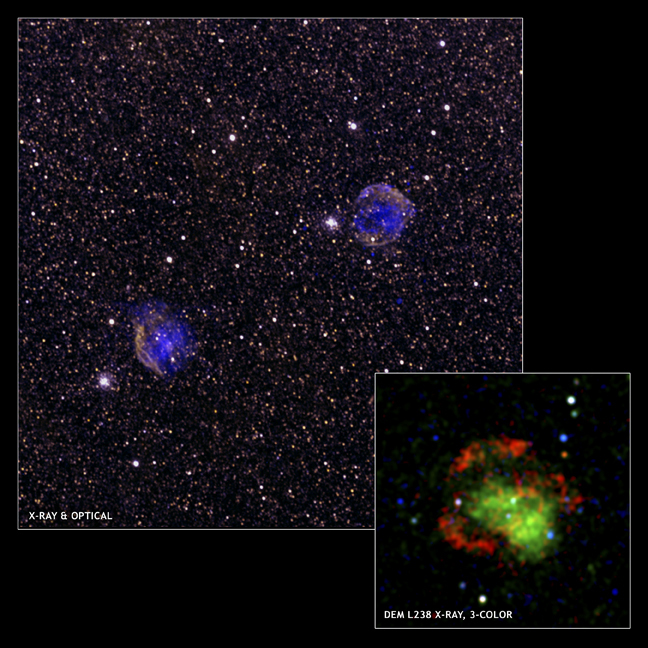 The large field-of-view is a composite image of DEM L238 (right) and DEM L249, Chandra X-ray data in blue and optical data in white. The inset reveals how DEM L238 appears in the three bands of X-ray emission (low energy X-rays are shown in red, medium energies in green and high energies in blue.) The central region of DEM L238 is green which indicates that it is rich in iron. This overabundance of iron identifies this object as a so-called Type Ia supernova, one possible explosive death of a star. In a Type Ia supernova, a white dwarf, the dense final stage in the evolution of a sun-like star, pulls so much mass from an orbiting companion star that it cannot support its own weight. The star collapses and temperatures become high enough for carbon fusion to occur. Fusion begins throughout the white dwarf almost simultaneously and an explosion occurs. A surprising feature of these images is that the iron in the central regions of DEM L238 and DEM L249 is much denser that in most Type Ia supernovas. The most likely explanation for these results is that the white dwarfs exploded into very dense environments. This implies that the stars which evolved into the white dwarfs were more massive than usual, since such stars expel more gas into their surroundings. These stars would explode in much less time -- about 100 million years -- than the billions of years that astronomers think Type Ias typically require. Coordinates (J2000) RA 05h 34m 08.80s | Dec -70º 34' 28.00"